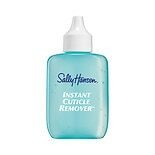 Shop Sally Hansen Instant Cuticle Remover (1 oz. )1 oz. 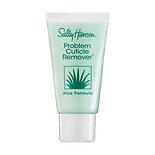 Shop Sally Hansen Problem Cuticle Remover (1 oz. )1 oz. Keep your nails looking healthy and well-groomed by using your choice of cuticle removers. Some cuticle treatments condition your nails while softening the cuticle. 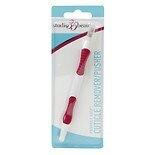 Other cuticle removers work to dissolve the cuticle almost instantly. Find the conditioning cuticle remover from brands such as Sally Hansen, Revlon and Essie that can work for you. 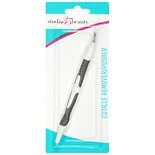 Once you've softened your cuticles with a cuticle remover, it's simple to push them back with a cuticle pusher. If you prefer, you could even remove them by using cuticle nippers or cuticle scissors. Any of these methods help clear the nail of unwanted cuticles for a neat-looking home manicure. When you're not working on your cuticles, you can soften, strengthen, condition or polish your nails with our assortment of nail care products here at Walgreens.com. We carry base coats and top coats with nail health benefits, as well as coats that help your nail color last longer. Other nail top coats can help the nail polish dry faster. Stock up on an array of colors for each season, occasion or outfit.